Empowering you to take control one bite at a time. Buy Cooking for Chemo …and After! What is Cooking For Chemo? Never underestimate the power of seasonings, herbs, and spices when you are cooking for someone one going through cancer treatment. Herbs and spices can be used to remedy naturally odiferous foods and make them more palatable those going through cancer treatment. I am probably going to insult a few people accidentally in this article about smell. I wish to express that I am not attempting to insult anyone, but the information I am presenting must be thought of in this manner for one to begin to understand the link between smell, appetite, nausea and chemotherapy. Humans, like many other creatures, are mammals and all evolved from the same original animal. As such, humans posses the same sense categories that almost all other mammals posses. These are: Sight (visual sense), Hearing (auditory sense), Touch (kinesthetic sense), Smell (olfactory senses), and Taste (lingual senses). These of course are broken down into sub-categories and so on. As I show in my book, Cooking for Chemo …and After!, all of these senses are connected into one big a experience called consciousness. They are all part of the human experience as a whole, and more specifically all part of the flavor experience. Chemotherapy sends the entirety of your body’s senses and functions out of alignment and one of the functions that is majorly impacted is your sense of smell. Your sense of smell is actually your strongest sense. You are able to identify a trillion of independent odors, whereas your eyes can only perceive about 10 million colors. When most people think of smell, they think of dogs. Dogs are always sniffing everything. This is for a very good reason. Through smell, they are able to detect a great many things: food, water, mates, danger, bombs, and even some forms of cancer. While dogs embrace smell, humans tend to actively shun their sense of smell, going so far as to look at people suspiciously when someone smells something. Yes, I know this from personal experience. There is actually some strong evidence that suggests humans actually put off various odors based on their emotional states. Have you ever heard of someone “stinking of desperation?” As a chef, my sense of smell is my greatest strength and being able to identify different scents and match them to other complimentary scents is one of the aspects that allows you to become a great chef. So, why do dogs have it all figured out and humans stick their nose up at the idea of smell? Well, that probably has a bit to do with the desire to feel “civilized” and detached from our idea of nature. But that is neither here nor there. 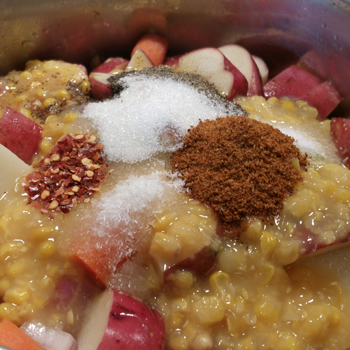 What I am going to do is teach you how to regain control of that ever so powerful sense and use it to modify your cooking to compensate for cancer and chemotherapy’s ravages on yourself or your loved one. The very first thing I want you to do is start smelling things. I want you to smell everything. I want you to smell herbs, spices, vinegar, meat, shoes, newspapers, books, computers, vegetables, clean laundry, dirty laundry, and anything else you can get your hands on. I assure you that people will eyeball you very suspiciously. I have a habit of smelling everything. I smell my flatware when I’m out to eat. I smell my food when people have cooked it for me. I smell newspapers. I smell my pants and even my shoes before I put them on. The reason I do this is to find out more information about the item that I am smelling. Smelling flatware at a restaurant tells me a few things. If it smells like chlorine, I know that they use bleach as their sanitizer and that the flatware has been recently been washed. If it smells like food, I know that it hasn’t been washed and that I should get a different fork. Smelling food tells me many things about it as well. I can tell the doneness of food by scent. If it is a steak, I can tell if the fat has been cooked long enough to become liquid and move through the meat. I can tell if raw food is past its prime thanks to a signature bacterial odor. I can also tell the pungency and strength of spices so I know how much to use when I am cooking. If I smell my pants, I can tell if they are dirty and if I need to wash them. As you can see, there are a great many uses for smell, both offensive and defensive. “…Another thing you absolutely must know is the concept of “pungent,” which is how powerful the smell of an item is. For example, roses have a light smell and are not very pungent, but old fish is very pungent and will have an off-putting smell. Some would say that smell is stinky. This variation of strength of pungency is something you will learn to develop as time goes on, and as you become more proficient with your cooking techniques. What you want to keep in mind is that while your olfactory sense can be your greatest strength in cooking for a cancer patient going through chemotherapy, it can also be your greatest enemy. So, if you have cancer or going through chemotherapy and are experiencing a loss of appetite or increased nausea, I would strongly advise smelling many different scents and documenting what scents you find appealing, and what scents you find nauseating or sickening. If you are finding that your nose is extra sensitive during cancer or chemotherapy treatment, I can say that there are a few things you should attempt to avoid. Those would be items that are extremely pungent like canned fish, broccoli, asparagus, mustard greens, kimchi, and eggs (just to name a few). Depending on where in the United States I live, I find that sometimes chicken and pork can have a certain odor to it as well. This doesn’t mean that these foods are necessarily bad for you from a nutrition stand point. But, their pungency can be extremely off-putting to a cancer patient going through chemotherapy. This can cause a well developed appetite to be lost in mere seconds. Remember, when we are cooking for cancer and chemotherapy, our only goal is to get good nutrients into your loved ones irregardless of what form we have to do that in. I will also tell you, one of the best way to mask pungent odors is with acidic liquids like vinegars and citrus juices. Since each person is different, I would of course smell everything first and see what exactly irritates your nose! Don’t go blacklisting complete food groups unless you know for certain what it is that is truly irritating you! So how do we compensate for the nauseating effects, while boosting a cancer patients appetite during chemotherapy? Quite simply, we are going to cook better! 1: Be a dog; not a human. Sniff everything you possibly can! Remember to document all of the smells and how they make you feel. By utilizing the list that we have compiled and detailing foods that we find irritating, we can remove those foods and find foods that will work in substitution, or completely omit the stinky foods all together. So if bell peppers bother you, more than likely all other types of peppers will as well. Simply omit the peppers from the recipe. Try zucchini in substitution to get the same fullness to the dish. 2: Use my roundness of flavor theory to season our recipes. My cooking techniques will help you compensate for the flavor changes that occur for a cancer patient during chemotherapy. Remember to have a holistic view when cooking for cancer patients and chemotherapy. All of your senses are linked, and that tasting occurs more in the nose that on the actual tongue. Smell all your ingredients before you add them to your recipe to make certain that there will be no irritation. 3: Use vinegars or citrus juices to mellow out pungent odors. We want to make certain that if we are using vinegar that we a) cook the vinegar in long enough to reduce its own pungency and b) cover the taste of the vinegar with sugar. Remember this cooking tip: sugar follows vinegar. When using vinegar, remember that it only takes one to two tablespoons of red wine vinegar per recipe, and that we follow that with an equal amount of sugar. 4: Season all our food in the following order: salty, savory, spicy, sour, and sweet. By adding just a little bit of each flavor at a time, we can slowly and progressively tweak the flavors until we find the perfect balance for our taste. 5: Make tasting notes as you cook. I could not have written my cookbook, Cooking for Chemo …and After! if I had not made tasting notes every time I fed my mom something as she was going through chemotherapy treatments for breast cancer. Remember that cooking is both an art and a science. To get your cooking perfect, you will have to experiment with food and write down the results to know what to do and what not to do when you cook! Do more of what works, and less of what doesn’t work. Honestly, practice makes perfect. This is especially true with cooking. Odds are the first few recipes you cook will turn out less than perfect. But, through resilience and strength of will you can succeed when cooking for cancer and chemotherapy. For additional reading and information, please see Chapters 1 and 2 of my how-to-cook cookbook Cooking for Chemo …and After! 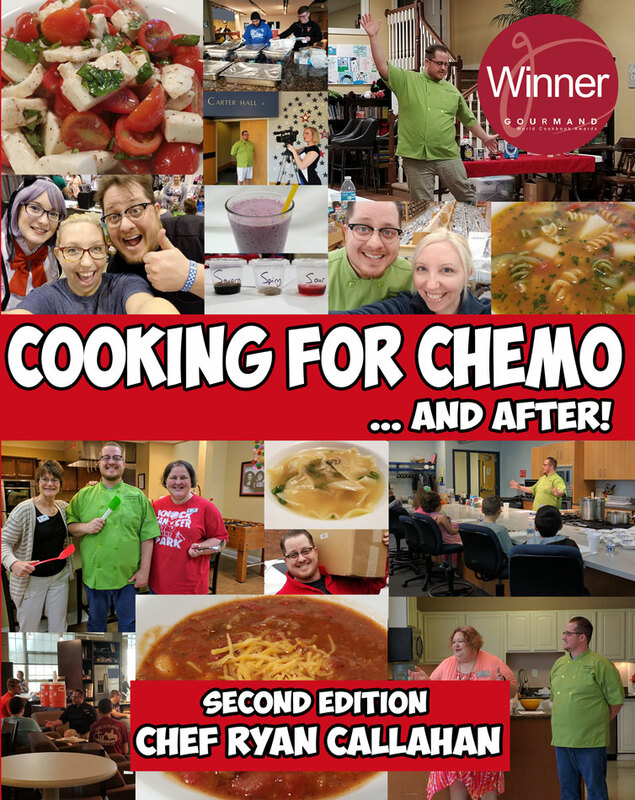 Grab a Copy of Cooking for Chemo ...and After! Second Edition! Join our FREE Cooking Club and Receive Exclusive Content, Tips, Videos, Recipes, and Our LIVE Show Recaps Straight to your Inbox! Keep up to date with Chef Ryan and everything Cooking for Chemo! Chef Ryan is a 2x Gourmand Award Winner!